The man has become “The Dean” for his longevity in the Los Angeles sports media scene with both his honest opinions and reasoned perspective. So it should not be surprising that Fred Roggin, KNBC’s longtime sports anchor and host of “Lunchtime with Roggin and Rodney” on AM570, has a sharp take on what to make of the Lakers’ success in Las Vegas Summer League. In the latest episode of the “We Want Tacos” Lakers podcast, Roggin broke down the big-picture implications from Summer League and what developments will just stay in Vegas. Roggin also shares his analysis on Lonzo Ball’s early play, what constitutes success next season and the direction the Lakers are going under a new front office with Magic Johnson and Rob Pelinka. Roggin, who has won various Emmy awards (36), Golden Mikes (22) and Associated Press honors (three), also shares his memories covering the Lakers and what it was like to interact with the Lakers’ late broadcaster Chick Hearn. You can hear more of Roggin’s insights on “Lunchtime with Roggin and Rodney” everyday on AM570 from noon- 2 pm PT every weekday. You can watch Roggin every night on NBC4 as well as on “Going Roggin” that airs on Saturdays (3 pm PT) and on Sundays (midnight PT). The Los Angeles Lakers introduced newly signed guard Kentavious Caldwell-Pope during a press conference with General Manager Rob Pelinka, right, and President of Basketball Operations Earvin “Magic” Johnson Tuesday, July 18, 2017, El Segundo, CA. 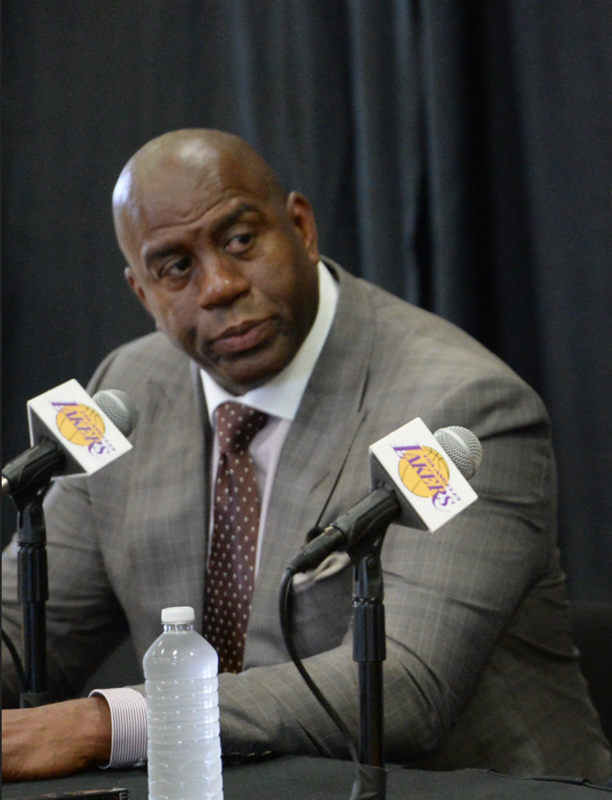 EL SEGUNDO – Magic Johnson did not enter the Lakers’ offseason planning to trade D’Angelo Russell by whatever means necessary. Johnson also did not enter the Lakers’ offseason hellbent on holding onto Russell no matter what other teams offered. The Lakers remained intrigued with Russell’s skills as a point guard as he further developed his outside shot and showed flashes of his superior passing. The Lakers still remained skeptical, however, of Russell’s various other qualities regarding his leadership and work ethic. So while the Lakers stayed convinced that Russell would further develop with more experience and maturity, they harbored questions on whether he could become the franchise’s new face following the Kobe Bryant era. Under that framework, Johnson had higher priorities as the Lakers’ president of basketball operations. Find a way to trade either of the burdensome contracts in veterans Timofey Mozgov (three years, $48 million) or Luol Deng (three years, $54 million). Collect draft picks. Stay aggressive in trades (Paul George) without squandering their No. 2 pick and second-year forward Brandon Ingram. Acquire players with positional versatility, an outside shot and a defensive presence, so the Lakers can adapt to the modern NBA. After four teams offered various trade proposals involving Russell, Johnson finally heard one that fulfilled his goals. The Brooklyn Nets would accept Mozgov and Russell in exchange for center Brook Lopez and the No. 27 pick. “They got a great player in D’Angelo and we got what we wanted,” Johnson said. EL SEGUNDO — The Lakers are continuing their deliberative approach to free agency by bolstering their backcourt without compromising their long-term cap flexibility. Later with a smaller gathering of reporters, Johnson said there are “five or six guys we’re considering” to fill a vacant back-up point guard spot. The most likely candidates, according to league sources, are either free-agent guards Ian Clark or Tyler Ennis through their “room” exception worth $4.3 million. Clark could help the team’s outside shooting after averaging a career-high 6.8 points while shooting 48.7 percent from the field and 37.4 percent from 3-point range last season with Golden State. The Lakers view the 26-year-old Clark as a good mentor for rookie point guard Lonzo Ball after helping the Warriors win the 2017 NBA championship. After only playing four years in the NBA, Clark still could further cement his career with the Lakers should he have a productive season. Incidentally, the Warriors decided not to retain Clark and pursued Nick Young after he opted out of his $5.7 million contract with the Lakers to become a free agent. Meanwhile, the Lakers have also expressed interest in the 22-year-old Ennis after he posted a career-high 7.7 points on 45.1 percent shooting and 2.4 assists in 17.8 minutes through 22 games following a mid-season trade from Houston. It remains to be seen if the Lakers hold firm on trying to find a more experienced point guard. The Lakers currently have 13 players under contract for their regular-season roster, while also signing guard Alex Caruso to a two-way contract. The Lakers can field a maximum 15-player roster for the 2017-18 regular season, while holding two additional roster spots for players on a two-way contract. Lakers rookie center Thomas Bryant could be a candidate for a two-way contract, which would allow a player to spend up to 45 days with NBA team and the remaining time with its G-League affiliate. 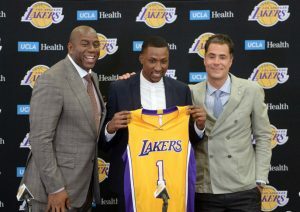 The Lakers and Southbay Lakers would split the costs on the player, depending on how long he is with each organization. The Lakers can fill out the rest of their roster with veteran-minimum deals. The Lakers decided not to shut at least some of their key players for the remainder of Vegas Summer League. Both Lakers rookie guard Lonzo Ball and rookie forward Kyle Kuzma will be available for when the Lakers (1-2) play the Philadelphia 76ers (1-2) on Wednesday at 7:30 pm PT at the Thomas & Mack Center. Lakers rookie guard Josh Hart (sprained right ankle) and rookie guard PJ Dozier (sprained left ankle) will sit out. After Ball’s absence on Monday eliminated a marquee matchup against Kings guard and No. 5 pick De’Aaron Fox, Ball will return against a Sixers team that sidelined No. 1 pick Markelle Fultz after spraining his left ankle last weekend. After nursing various ailments that kept them out of Monday’s game against Sacramento, Ball (right groin) and Kuzma (cramps) completed the team’s voluntary workout on Tuesday. Hart has missed the past two games, while Dozier suffered his injury during Monday’s game against the Kings. The Lakers will field a new lineup when accounting for shutting down second-year forward Brandon Ingram (cramps) and waiving second-year guard David Nwaba. Among the standouts in Monday’s win over Sacramento included guard Vander Blue (21 points, six rebounds, two assists in 29 minutes off the bench) and guard Alex Caruso (18 points, nine assists, four steals in 30 minutes as a starter). If the Lakers beat the Sixers on Wednesday, they will play next on Thursday at 7:30 pm. If the Lakers lose on Wednesday, they would play their final game in the consolation bracket on Friday at 5:30 pm PT. 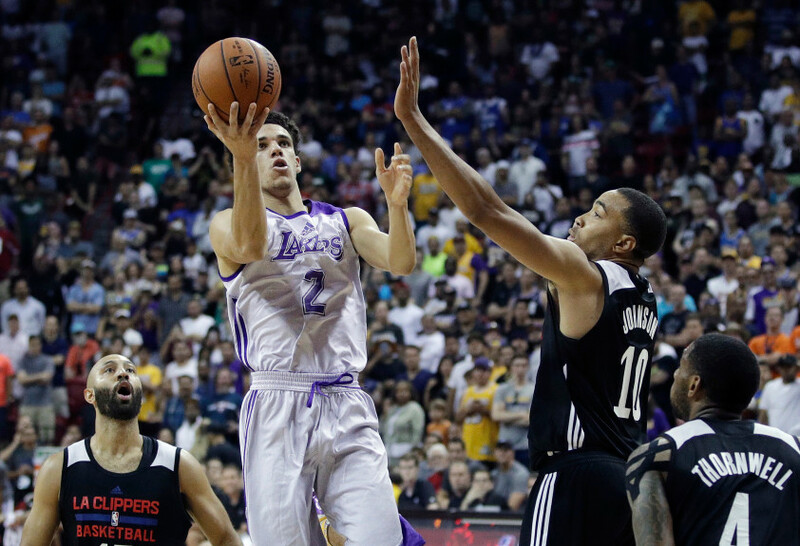 No rookie has eyes on him during Summer League play like Lakers point guard Lonzo Ball. There’s focus on his shooting struggles. There’s analysis on if his absence in Monday’s game in Sacramento had more to do with ducking a No. 5 pick De’Aaron Fox than an actual groin injury. And, of course, there’s attention on his outspoken father, LaVar. Even through all those circumstances, I explain in the latest “We Want Tacos” Lakers podcast why Ball’s summer-league play has mostly been encouraging for his rookie season. 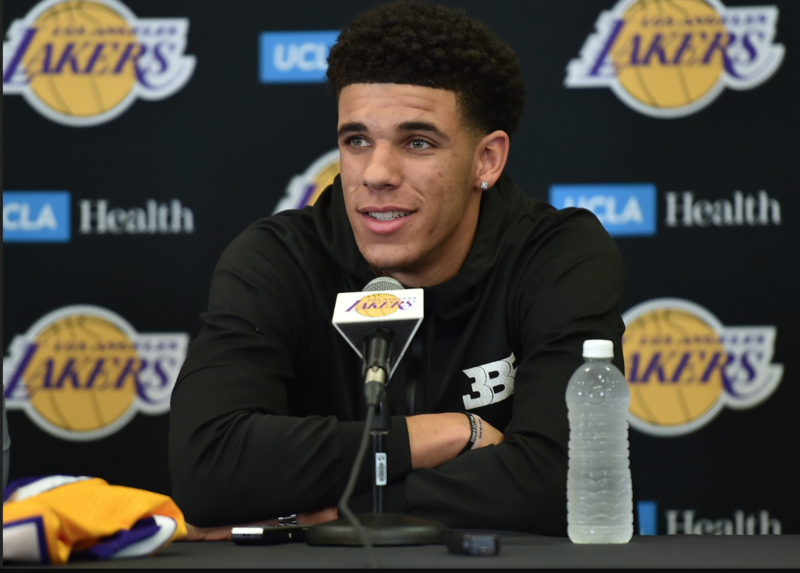 The episode also features sound from Lonzo Ball, teammates Brandon Ingram and Jordan Clarkson, Lakers head coach Luke Walton and summer-league head coach Jud Buechler as well as LaVar Ball himself. 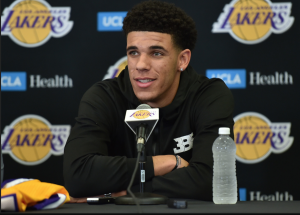 LAS VEGAS – Lakers rookie guard Lonzo Ball will not play in Monday’s summer-league game against the Sacramento Kings because of a sore right groin, according to a league source familiar with the situation. The Lakers later announced that rookie forward Kyle Kuzma (cramps) would sit out after already ruling out rookie shooting guard Josh Hart (sprained right ankle) and shutting down second-year forward Brandon Ingram (cramps). The Lakers also listed rookie center Thomas Bryant as probable after experiencing soreness in his left knee. Ball originally had a groin injury last week practice before Summer-League play, the source said. Lakers assistant coach Jud Buechler, the team’s summer-league coach, had mentioned on Friday that Ball was “banged up” in recent days. Ball then felt soreness after playing on Friday and Saturday, the source said. Nonetheless, the Lakers do not consider the injury serious, and are taking precautionary measures. The Lakers (0-2) have not formally shut Ball down for the remainder of summer-league play. The Lakers have at least two more games to play and a possibly postseason appearance if they win at least one game. 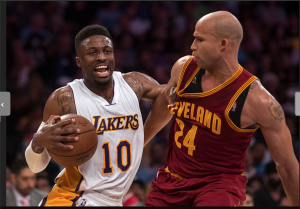 But it would not be surprising if the Lakers rule Ball out for precautionary reasons. 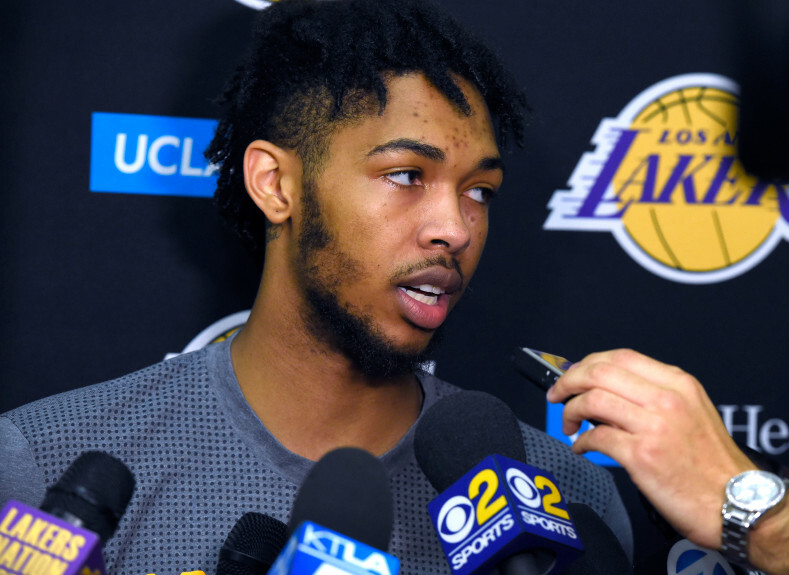 The Lakers had shut down Ingram for summer-league play after he nursed a cramp in his right leg in the opener on Friday against the Clippers. Ball’s absence strips away a potential rematch between the Lakers’ No. 2 pick and No. 5 pick De’Aaron Fox, who had scored 39 points against UCLA in the NCAA tournament. Fox tweeted out an emoji of a facepalm, a post that was soon quickly deleted. Ball also loses the chance to build off of his play that has fielded mixed results. After Ball finished with five points while shooting 2 of 15 from the field and 1 of 11 from 3-point range on Friday against the Clippers, Ball followed with 11 points while shooting a 5-of-13 a clip and 1-of-5 from the perimeter. Yet, Ball also offered promising signs with his passing and ability to run the offense. After logging five assists, four rebounds, two steals and a block against the Clippers, Ball recorded a triple-double against the Celtics with 11 assists and 11 rebounds. That marked the first triple-double in Las Vegas Summer League history since 2008 when statistics were recorded consistently. LAS VEGAS –For a player that prides himself on his versatility, Lakers rookie forward Kyle Kuzma has tried to ensure he does not become among the many workers that fall victim to this trend in many industries. So with the Lakers selecting him with the 27th pick in the 2017 NBA Draft, Kuzma tried to show his worth amounted beyond his ability to play multiple positions and willingness to make hustle plays. He wanted to prove he could shoot the ball well. So, Kuzma took on the repetitive task in focusing on that skill recently in gym workouts. In the Lakers’ 86-81 loss to the Boston Celtics on Saturday at Thomas & Mack Center, Kuzma provided some early returns on investment. He posted a team-leading 31 points, while shooting 12 of 26 from the field and 5 of 10 from 3-point range. Will the Lakers win the Las Vegas Summer League championship? One thing mostly drove the Lakers as they sought NBA supremacy both in play and entertainment value. That entailed winning an NBA championship, an instance that happened 11 of 16 times after Minneapolis moved its franchise to Los Angeles. So it should not be surprising that the Lakers’ next potential star outlined the team’s goal in Las Vegas Summer League this way. Can the Lakers develop that winning attitude to bring home some championship hardware? In the latest episode of the “We Want Tacos” Lakers podcast, Ball, second-year forward Brandon Ingram, second-year center Ivica Zubac, rookie forward Kyle Kuzma, rookie shooting guard Josh Hart and Summer League coach Jud Buechler share their views on what will help them reach that goal. Can the Thunder keep Paul George from bolting to the Lakers?